Figure 1-37. 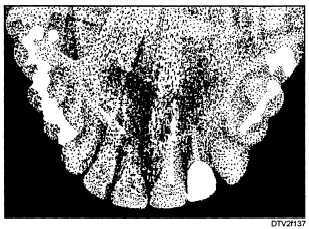 - Typical maxillary anterior occlusal radiograph. and bitewing packets, the occlusal packet contains two X-ray films. This allows different developing times to be used for these films. The finished radiographs can then be compared for diagnostic purposes. Occlusal radiographs are exposed using the bisected angle technique. 2. Position the patient so that the ala-tragus line is parallel with the floor, and the mid-sagittal plane is perpendicular to the floor. 3. Place the film in the patient's mouth. Occlusal films are normally very comfortable. Have the patient relax the muscles of the mouth and cheek as much as possible. The pebbled surface of the packet should be toward the occlusal surfaces of the maxillary teeth, and the narrow side of the packet toward the patient's cheeks. To place the packet, retract one corner of the patient's mouth until the packet can be inserted. Position the packet far enough in the mouth so that it covers all the teeth. Special care must be taken to avoid gagging the patient. Have the patient close gently but firmly on the packet to hold it in place. Figure 1-38. 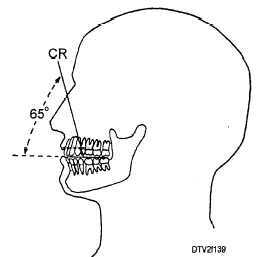 - Projection of central ray (CR) for maxillary anterior occlusal radiographs. patient's nose so that the central X-ray beam will be projected as shown in fig. 1-38.
b. For maxillary posterior occlusal radiographs, set the vertical angulation of the tube head at +75°. Center the tube head at the top of the patient's nose so that the central X-ray beam will be projected as shown in fig. 1-39. Figure 1-39. 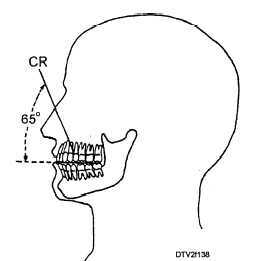 - Projection of central ray (CR) for maxillary posterior occlusal radiographs.